Executive conversion (N122B) with new windows. rear ventral entry and 200 U.S. gallon wing tanks. First photograph of the Convair modified search-and-rescue Douglas SC-54D of the U.S. A.R.S./M.A.T.S. Last summer Convair began modifying thirty-six C-54 Skymasters at Fort Worth. the most noticeable features being the additional nose radome and the look-out blister, in the rear fuselage . SC-54Ds are now arriving in Europe. 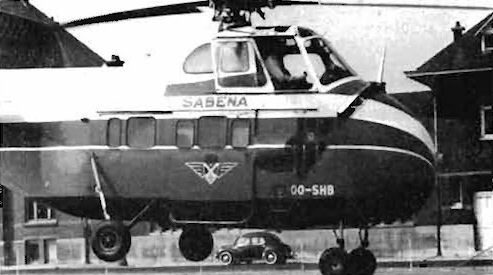 Since June 1955, U.S.-built S-55s have had retrofit additional side windows, and in the case of Sabena, nose lights. A89-311 of No.11 R.A.A.F. Squadron, Richmond, N.S.W., is a P2V-5 now fitted with the submarine detection tail extension of the P2V-7. Seen in Europe recently, the R.C.A.F. P2V-7 King Neptune with under-wing rocket rails. This view of a production Gloster Javelin F.(A.W.) Mk.1 shows to good effect the duo-taper wing leading edge and the sharp-pointed nose radome. Deliveries of the more powerful F.(A.W.) Mk.7 will start later this year. Photographed at Blackbushe recently, an Israeli air force Nord 2501-IS (5761) with radio call sign 4X-FAP, for ferrying purposes. Revised B.E.A. tail markings on Viscount G-AMOH. Revised colour scheme: Viscount 737 CF-GXK at Dorval, the temporary T.C.A. markings now replaced by those of the owners, the Canadian Department of Transport. Rarely illustrated is the R4Y-1, the U.S. Navy cargo-transport version of the U.S.A.F. C-131 Samaritan, the latest version of which is the RC-131G. Unlike the M.A.T.S. C-131s, the U.S. Navy's R4Y-1s have the white top decking extending to below the windows. French Indo-China WS-55, utilising R.A.F. serial WJ600. Still undergoing trials is the McDonnell XV-1 convertiplane. This photograph illustrates the second prototype 53-4017 (first was 53-4016), which has a number of modifications. The skid undercarriage is now bulkier and streamlined and the triangular rotor pylon has been cut down to reduce drag interference. The unusual markings on the fuselage of this Grumman Goose amphibian flying over the snow-clad Northwest Territory are those of the U.S. Fish and Wildlife Service (U.S. Department of the Interior), N749 is used for waterfowl survey. Seen in the United Kingdom recently. a Lockheed P-38L (N65485), orange overall, of World Wide Surveys, Inc. Note camera positions. Modified B-25 Mitchell, R.C.A.F. crew trainer with revised nose. The sole twin-boom Cancargo CBY-3 Loadmaster (N17N) of 1945 now has a new paint finish and markings of Rutas Aereas Nacionales S.A., Venezuela. Since this photograph was taken the Registration N17N has been altered to YV-X-ERC (X = experimental).